Nrf2 supports the activation of a group of antioxidant and detoxifying enzymes and genes which protect the human body from the effects of health issues associated with increased levels of oxidative stress, such as Alzheimer’s disease. A variety of natural substances have been demonstrated to activate the Nrf2 pathway, which can help manage the symptoms of neurodegenerative diseases. The purpose of the article below is to discuss the pivotal role of Nrf2 caused by chronic inflammation. Inflammation is the most common feature of many chronic diseases and complications, while playing critical roles in carcinogenesis. Several studies have demonstrated that Nrf2 contributes to the anti-inflammatory process by orchestrating the recruitment of inflammatory cells and regulating gene expression through the antioxidant response element (ARE). The Keap1 (Kelch-like ECH-associated protein)/Nrf2 (NF-E2 p45-related factor 2)/ARE signaling pathway mainly regulates anti-inflammatory gene expression and inhibits the progression of inflammation. Therefore, the identification of new Nrf2-dependent anti-inflammatory phytochemicals has become a key point in drug discovery. In this review, we discuss the members of the Keap1/Nrf2/ARE signal pathway and its downstream genes, the effects of this pathway on animal models of inflammatory diseases, and crosstalk with the NF-κB pathway. 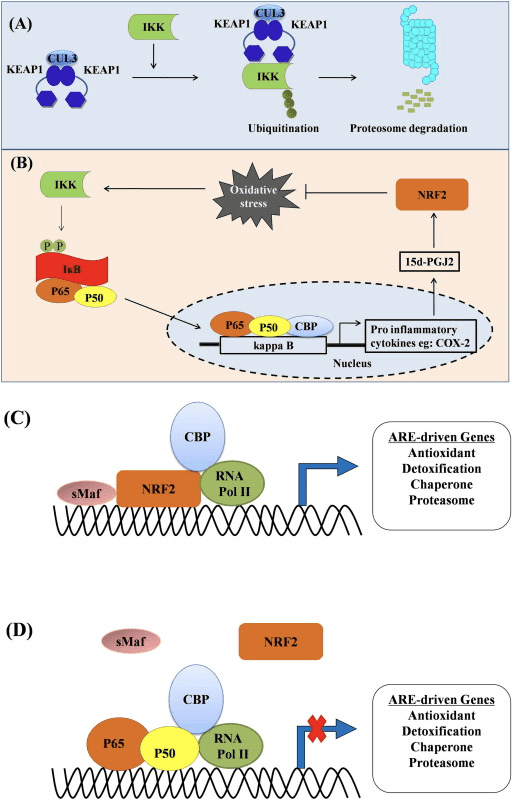 In addition we also discuss about the regulation of NLRP3 inflammasome by Nrf2. Besides this, we summarize the current scenario of the development of anti-inflammatory phytochemicals and others that mediate the Nrf2/ARE signaling pathway. Inflammation is a complex process that occurs when tissues are infected or injured by harmful stimuli such as pathogens, damage, or irritants. Immune cells, blood vessels, and molecular mediators are involved in this protective response . 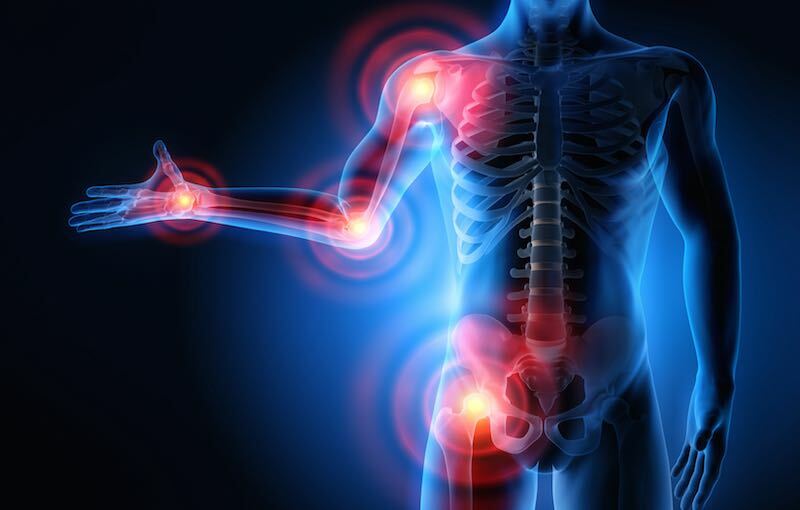 Inflammation is also a pathological phenomenon associated with a variety of disease states induced mainly by physical, chemical, biological, and psychological factors. The aim of inflammation is to limit and eliminate the causes of cellular damage, clear and/or absorb necrotic cells and tissues, and initiate tissue repair. Two distinct forms of inflammation are distinguished: acute and chronic. Acute inflammation is self-limiting and beneficial to the host, but prolonged chronic inflammation is a common feature of many chronic diseases and complications. Direct infiltration by many mononuclear immune cells such as monocytes, macrophages, lymphocytes, and plasma cells, as well as the production of inflammatory cytokines, lead to chronic inflammation. It is recognized that chronic inflammation plays a critical role in carcinogenesis . In general, both pro- and anti-inflammatory signaling pathways interact in the normal inflammatory process. In the pathological inflammatory process, mast cells, monocytes, macrophages, lymphocytes, and other immune cells are first activated. Then the cells are recruited to the site of injury, resulting in the generation of reactive oxygen species (ROS) that damage macromolecules including DNA. At the same time, these inflammatory cells also produce large amounts of inflammatory mediators such as cytokines, chemokines, and prostaglandins. These mediators further recruit macrophages to localized sites of inflammation and directly activate multiple signal transduction cascades and transcription factors associated with inflammation. The NF-κB (nuclear factor kappa B), MAPK (mitogen-activated protein kinase), and JAK (janus kinase)-STAT (signal transducers and activators of transcription) signaling pathways are involved in the development of the classical pathway of inflammation , , . Previous studies have revealed that the transcription factor Nrf2 (NF-E2 p45-related factor 2) regulates the expression of phase II detoxifying enzymes including NADPH, NAD(P)H quinone oxidoreductase 1, glutathione peroxidase, ferritin, heme oxygenase-1 (HO-1), and antioxidant genes that protect cells from various injuries via their anti-inflammatory effects, thus influencing the course of disease , , . 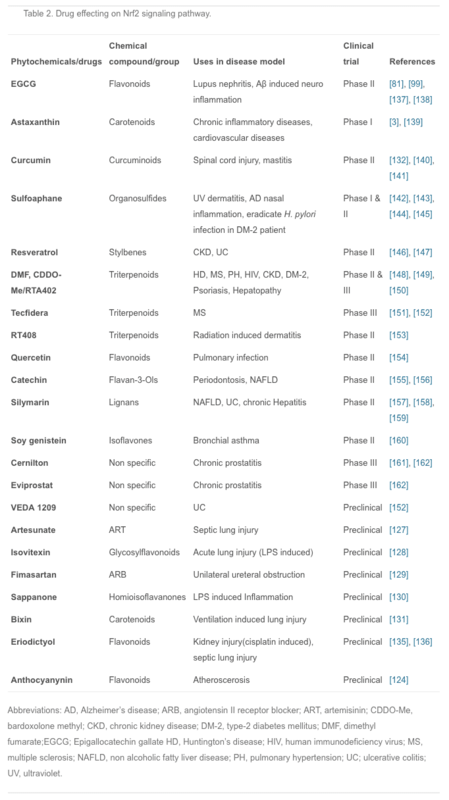 Considering these remarkable findings, the development of targeted therapeutic drugs for inflammatory diseases via signaling pathways has attracted much interest in recent years. 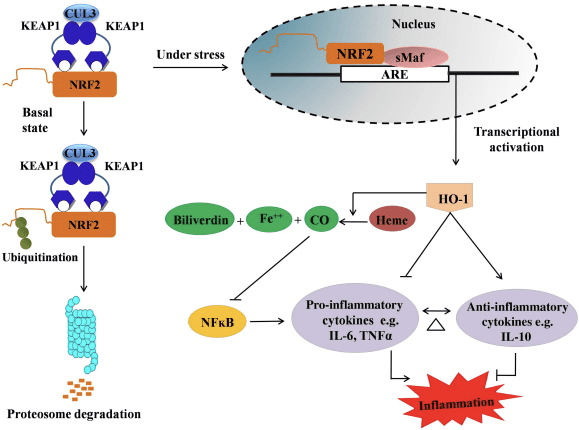 In this review, we summarize research on the Keap1 (Kelch-like ECH associated protein)/Nrf2 (NF-E2 p45-related factor 2)/ARE (antioxidant response element) signaling pathway in inflammation. Nrf2 belongs to the Cap ‘n’ Collar (CNC) subfamily and comprises in seven functional domains, Neh (Nrf2-ECH homology) 1 to Neh7 , . Neh1 is a CNC-bZIP domain that allows Nrf2 to heterodimerize with small musculoaponeurotic fibrosarcoma (Maf) protein, DNA, and other transcription partners as well as forming a nuclear complex with the ubiquitin-conjugating enzyme UbcM2 , . Neh2 contains two important motifs known as DLG and ETGE, which are essential for the interaction between Nrf2 and its negative regulator Keap1 , . Keap1 is a substrate adaptor for cullin-based E3 ubiquitin ligase, which inhibits the transcriptional activity of Nrf2 via ubiquitination and proteasomal degradation under normal conditions , , . The KELCH domains of the Keap1 homodimer bind with the DLG and ETGE motifs of the Nrf2-Neh2 domain in the cytosol, where ETGE acts as a hinge with higher affinity and DLG acts as a latch . Under oxidative stress or upon exposure to Nrf2 activators, Nrf2 dissociates from Keap1 binding due to the thiol modification of Keap1 cysteine residues which ultimately prevents Nrf2 ubiquitination and proteasomal degradation . Then Nrf2 translocates into the nucleus, heterodimerizes with small Maf proteins, and transactivates an ARE battery of genes (Fig. 1A). The carboxy-terminal of Neh3 acts as a transactivation domain by interacting with the transcription co-activator known as CHD6 (chromo-ATPase/helicase DNA binding protein) . Neh4 and Neh5 also act as transactivation domains, but bind to another transcriptional co-activator known as CBP (cAMP-response-element-binding protein-binding protein) . Moreover, Neh4 and Neh5 interact with the nuclear cofactor RAC3/AIB1/SRC-3, leading to enhanced Nrf2-targeted ARE gene expression . Neh5 has a redox-sensitive nuclear-export signal which is crucial for the regulation and cellular localization of Nrf2 . 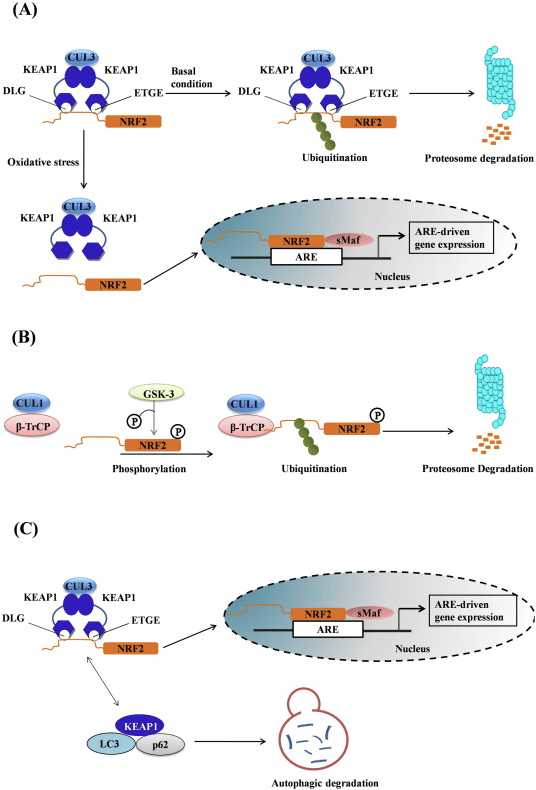 Figure 1 Keap1-dependent and -independent regulation of Nrf2. (A) Under basal conditions, Nrf2 is sequestered with Keap1 by its two motifs (ETGE and DLG) that leads to CUL3-mediated ubiquitination followed by proteasome degradation. Under oxidative stress, Nrf2 dissociates from Keap1, translocates to the nucleus and activates the ARE-gene battery. (B) GSK3 phosphorylates Nrf2 and this facilitates the recognition of Nrf2 by β-TrCP for CUL1-mediated ubiquitination and subsequent proteasome degradation. (C) p62 is sequestered with Keap1, leading to its autophagic degradation, the liberation of Nrf2, and increased Nrf2 signaling. Emerging evidence has revealed a novel mechanism of Nrf2 regulation that is independent of Keap1. The serine-rich Neh6 domain of Nrf2 plays a crucial role in this regulation by binding with its two motifs (DSGIS and DSAPGS) to β-transducin repeat-containing protein (β-TrCP) . β-TrCP is a substrate receptor for the Skp1–Cul1–Rbx1/Roc1 ubiquitin ligase complex that targets Nrf2 for ubiquitination and proteasomal degradation. Glycogen synthase kinase-3 is a crucial protein involved in Keap1-independent Nrf2 stabilization and regulation; it phosphorylates Nrf2 in the Neh6 domain to facilitate the recognition of Nrf2 by β-TrCP and subsequent protein degradation  (Fig. 1B). Another line of evidence has revealed a non-canonical pathway of p62-dependent Nrf2 activation in which p62 sequesters Keap1 to autophagic degradation that ultimately leads to the stabilization of Nrf2 and the transactivation of Nrf2-dependent genes , , ,  (Fig. 1C). Accumulating evidence suggests that several miRNAs play an important role in the regulation the Nrf2 activity . Sangokoya et al. demonstrated that miR-144 directly downregulates Nrf2 activity in the lymphoblast K562 cell line, primary human erythroid progenitor cells, and sickle-cell disease reticulocytes. Another interesting study in human breast epithelial cells demonstrated that miR-28 inhibits Nrf2 through a Keap1-independent mechanism . Similarly, miRNAs such as miR-153, miR-27a, miR-142-5p, and miR144 downregulate Nrf2 expression in the neuronal SH-SY5Y cell line . Singh et al. demonstrated that the ectopic expression of miR-93 decreases the expression of Nrf2-regulated genes in a 17β-estradiol (E2)-induced rat model of mammary carcinogenesis. A recent discovery from our lab identified an endogenous inhibitor of Nrf2 known as retinoic X receptor alpha (RXRα). RXRα is a nuclear receptor, interacts with the Neh7 domain of Nrf2 (amino-acid residues 209–316) via its DNA-binding domain (DBD), and specifically inhibits Nrf2 activity in the nucleus. Moreover, other nuclear receptors such as peroxisome proliferator-activated receptor-γ, ERα, estrogen-related receptor-β, and glucocorticoid receptors have also been reported to be endogenous inhibitors of Nrf2 activity , . HO-1 is the inducible isoform and rate-limiting enzyme that catalyzes the degradation of heme into carbon monoxide (CO) and free iron, and biliverdin to bilirubin. Enzymatic degradation of pro-inflammatory free heme as well as the production of anti-inflammatory compounds such as CO and bilirubin play major roles in maintaining the protective effects of HO-1 (Fig. 2). Figure 2 Overview of the Nrf2/HO-1 pathway. Under basal conditions, Nrf2 binds to its repressor Keap1 which leads to ubiquitination followed by proteasome degradation. During oxidative stress, free Nrf2 translocates to the nucleus, where it dimerizes with members of the small Maf family and binds to ARE genes such as HO-1. Upregulated HO-1 catalyzes the heme into CO, bilirubin, and free iron. CO acts as an inhibitor of the NF-ĸB pathway which leads to the decreased expression of pro-inflammatory cytokines, while bilirubin also acts as antioxidant. Furthermore, HO-1 directly inhibits the proinflammatory cytokines as well as activating the anti-inflammatory cytokines, thus leads to balancing of the inflammatory process. Nrf2 induces the HO-1 gene by increasing mRNA and protein expression and it is one of the classic Nrf2 regulated gene which is widely used in numerous in vitro and in vivo studies. Several studies have demonstrated that HO-1 and its metabolites have significant anti-inflammatory effects mediated by Nrf2. Elevation of HO-1 expression which is mediated by activated Nrf2 leads to the inhibition of NFκB signaling results in the reduced intestinal mucosal injury and tight-junction dysfunction in male Sprague-Dawley rat liver transplantation model . Upregulation of Nrf2-dependent HO-1 expression may protect mouse derived C2C12 myoblasts from H2O2 cytotoxicity . Nrf2-dependent HO-1 has an impact on lipopolysaccharide (LPS)-mediated inflammatory responses in RAW264.7- or mouse peritoneal macrophage-derived foam cell macrophages. Nrf2 activity desensitized foam cell macrophages phenotype and prevent immoderate inflammation of macrophages, those play important role in progression of atherosclerosis . The Nrf2/HO-1 axis affects LPS induced mouse BV2 microglial cells and mouse hippocampal HT22 cells, with impact on neuroinflammation. Upregulation of HO-1 expression via Nrf2 pathway in mouse BV2 microglial cells which defend cell death of mouse hippocampal HT22 cells . Furthermore, cobalt-based hybrid molecules (HYCOs) that combine an Nrf2 inducer with a releaser of carbon monoxide (CO) increases Nrf2/HO-1 expression, liberate CO and exert anti-inflammatory activity in vitro. HYCOs also up-regulate tissue HO-1 and deliver CO in blood after administration in vivo, supporting their potential use against inflammatory conditions . Nrf2/HO-1 upregulation reduces inflammation by increasing the efferocytic activity of murine macrophages treated with taurine chloramines . Altogether, the above-explained experimental models revealed that Nrf2/HO-1 axis plays a major role in anti-inflammatory function, suggesting that Nrf2 is a therapeutic target in inflammation-associated diseases. 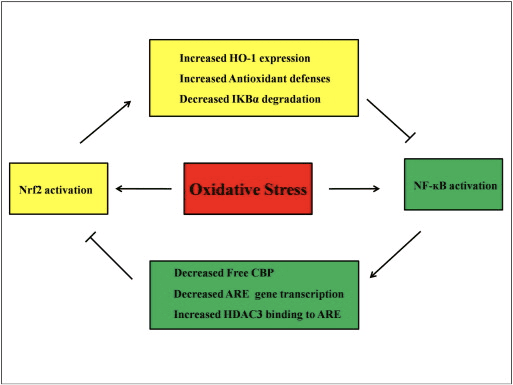 In addition, the byproducts of HO-1 such as CO, bilirubin, acts as a powerful antioxidant during oxidative stress and cell damage , ; it suppresses autoimmune encephalomyelitis and hepatitis , ; and it protects mice and rats against endotoxic shock by preventing the generation of iNOS and NO , , . Moreover, Bilirubin reduces endothelial activation and dysfunction . Interestingly, bilirubin reduces the transmigration of endothelial leukocytes via adhesion molecule-1 . 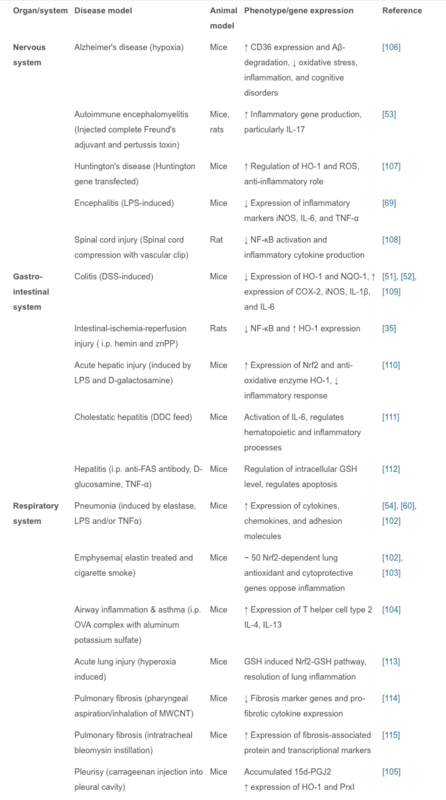 These specific references indicating not only HO-1 acts as a potent anti-inflammatory agent but also its metabolites. Cytokines are low molecular-weight proteins and polypeptides secreted by a variety of cells; they regulate cell growth, differentiation, and immune function, and are involved in inflammation and wound-healing. Cytokines include interleukins (ILs), interferons, tumor necrosis factor (TNF), colony-stimulating factor, chemokines, and growth factors. Some cytokines are counted as pro-inflammatory mediators whereas others have anti-inflammatory functions. Exposure to oxidative stress results in the overproduction of cytokines which causes oxidative stress in target cells. Several pro-inflammatory cytokines are overproduced when NF-ĸB is activated by oxidative stress. Furthermore, pro-inflammatory oxidative stress causes further activation of NF-ĸB and the overproduction of cytokines. Activation of the Nrf2/ARE system plays an important role in disrupting this cycle. Chemokines are a family of small cytokines, the major role of which is to guide the migration of inflammatory cells. They function mainly as chemoattractants for leukocytes, monocytes, neutrophils, and others effector cells. It has been reported that activation of Nrf2 prevents LPS-induced transcriptional upregulation of pro-inflammatory cytokines, including IL-6 and IL-1β . IL-1β and IL-6 production is also increased in Nrf2−/− mice with dextran sulfate-induced colitis , . Nrf2 inhibits the production of downstream IL-17 and other inflammatory factors Th1 and Th17, and suppresses the disease process in an experimental model of multiple sclerosis, autoimmune encephalitis . The Nrf2-dependent anti-oxidant genes HO-1, NQO-1, Gclc, and Gclm block TNF-α, IL-6, monocyte chemo attractant protein-1 (MCP1), macrophage inflammatory protein-2 (MIP2), and inflammatory mediators. But in the case of Nrf2-knockout mice, the anti-inflammatory effect does not occur . Peritoneal neutrophils from Nrf2-knockout mice treated with LPS have significantly higher levels of cytokines (TNF-α and IL-6) and chemokines (MCP1 and MIP2) than wild-type (WT) cells . In vitro, transferring the Nrf2 gene to human and rabbit aortic smooth muscle cells suppresses the secretion of MCP1 , , and Nrf2-dependent HO-1 expression suppresses TNF-α-stimulated NF-ĸB and MCP-1 secretion in human umbilical vein endothelial cells . These findings hint that, in response to inflammatory stimuli, upregulation of Nrf2 signaling inhibits the overproduction of pro-inflammatory cytokines and chemokines as well as limiting the activation of NF-ĸB. Cell adhesion molecules (CAMs) are proteins that bind with cells or with the extracellular matrix. Located on the cell surface, they are involved in cell recognition, cell activation, signal transduction, proliferation, and differentiation. Among the CAMs, ICAM-1 and VCAM-1 are important members of the immunoglobulin superfamily. ICAM-1 is present in low concentrations in leukocyte and endothelial cell membranes. Upon cytokine stimulation, the concentration significantly increases. ICAM-1 can be induced by IL-1 and TNF and is expressed by the vascular endothelium, macrophages, and lymphocytes. It is a ligand for integrin, a receptor found on leukocytes. When the ICAM-1-integrin bridge is activated, leukocytes bind to endothelial cells and then migrate into subendothelial tissues . VCAM-1 mediates the adhesion of lymphocytes, monocytes, eosinophils, and basophils to vascular endothelium and contributes to leukocyte recruitment, which ultimately leads to tissue damage due to oxidative stress. Nrf2 inhibits the promotor activity of VCAM-1 . The Nrf2-regulated downstream gene HO-1 can affect the expression of E-selectin and VCAM-1, adhesion molecules associated with endothelial cells . The pulmonary expression of several CAMs such as CD-14, TREM1, SELE, SELP, and VCAM-1 are significantly higher in Nrf2−/− mice than in Nrf2+/+ mice . Nrf2 in human aortic endothelial cells suppress TNF-α-induced VCAM-1 expression and interfere with TNF-α-induced monocytic U937 cell adhesion . Overexpression of Nrf2 also inhibits TNF-α-induced VCAM-1 gene expression in human microvascular endothelial cells . The naturally occurring antioxidant 3-hydroxyanthranilic acid (HA), one of l-tryptophan metabolites formed in vivo along the metabolic route known as the kynurenine pathway during inflammation or infection, is found to induce HO-1 expression and to stimulate Nrf2 in human umbilical vein endothelial cells (HUVECs). Nrf2-dependent HO-1 expression induced by HA inhibits MCP-1 secretion, VCAM-1 expression and NF-kB activation associated with vascular injury and inflammation in atherosclerosis . The anti-proliferative and anti-inflammatory synthetic chalcone derivative 2′,4′,6′-tris (methoxymethoxy) chalcone inhibits ICAM-1, the pro-inflammatory cytokine IL-1β, and TNF-α expression in colonic tissue from mice treated with trinitrobenzene sulfonic acid . Upregulation of Nrf2 inhibits the TNF-α-induced ICAM-1 expression in human retinal pigment epithelial cells treated with lycopene . All these studies suggest that Nrf2 plays a key role in the inflammatory process by regulating the migration and infiltration of inflammatory cells to inflamed tissue. MMPs are widely present in the extracellular matrix and are involved in physiological and pathological processes such as cell proliferation, migration, differentiation, wound-healing, angiogenesis, apoptosis, and tumor metastasis. It has been reported that the Nrf2/HO-1 axis inhibits MMP-9 in macrophages and MMP-7 in human intestinal epithelial cells, and this is beneficial in the treatment of inflammatory bowel disease , . UV irradiation-induced skin damage is more severe in Nrf2-knockout than in WT mice and the MMP-9 level is significantly higher, indicating that Nrf2 reduces MMP-9 expression. Therefore, Nrf2 is considered to be protective against UV irradiation . Another study also reported that the downregulated transcriptional activation of MMP-9 in tumor cell invasion and inflammation is regulated through inhibition of the NF-kB signaling pathway . In traumatic spinal cord injury, the NF-kB signaling pathway also takes part in regulating the mRNA levels of MMP-9 . Therefore, in inflammation the regulation of MMPs is affected directly by the Nrf2 pathway or indirectly through the Nrf2-influenced NF-κB pathway. A series of experiments on Nrf2-knockout mice have demonstrated its crucial role in inflammation and the regulation of pro-inflammatory genes such as COX-2 and iNOS. For the first time, Khor et al. reported increased expression of pro-inflammatory cytokines such as COX-2 and iNOS in the colonic tissues of Nrf2−/− mice compared with WT Nrf2+/+ mice, indicating that Nrf2 suppresses their activity . Another report on pretreatment with sulforaphane, one of the well-known Nrf2 activators present in cruciferous vegetables, demonstrated its anti-inflammatory effect of inhibiting the expression of TNF-α, IL-1β, COX-2, and iNOS at both the mRNA and protein levels in primary peritoneal macrophages from Nrf2+/+ mice compared with those from Nrf2−/− mice . Similarly, the hippocampus of Nrf2-knockout mice with LPS-induced inflammation also shows higher expression of inflammation markers such as iNOS, IL-6, and TNF-α than WT mice . Likewise, Nrf2-knockout mice are hypersensitive to the oxidative stress induced by 1-methyl-4-phenyl-1,2,3,6-tetrahydropyridine as well as showing increased mRNA and protein levels of inflammation markers such as COX-2, iNOS, IL-6, and TNF-α . Moreover, livers from Nrf2−/− mice challenged with a methionine- and choline-deficient diet have ~ 5-fold higher mRNA expression of Cox2, and iNOS than those from WT mice on the same diet, suggesting an anti-inflammatory role of Nrf2 . Recently, Kim et al. demonstrated that the phytochemical ethyl pyruvate exerts its anti-inflammatory and anti-oxidative effects by decreasing the expression of iNOS through Nrf2 signaling in BV2 cells. They showed that ethyl pyruvate induces the nuclear translocation of Nrf2, which ultimately inhibits the interaction between p65 and p300, leading to decreased expression of iNOS . Furthermore, the carbazole analogue LCY-2-CHO activates Nrf2 and causes its nuclear translocation, leading to the suppression of COX2 and iNOS expression  in rat aortic vascular smooth muscle cells. The NLR family, pyrin domain containing 3 (NLRP3) inflammasome is a multiprotein complex that functions as a pathogen recognition receptor (PRR) and recognizes the wide range of microbial, oxidative stress signals such as pathogen-associated molecular patterns (PAMPs), Damage-associated molecular pattern molecules (DAMPs) and ROS . The activated NLRP3 inflammasome mediates the cleavage of caspase-1 and secretion of pro-inflammatory cytokine interleukin-1β (IL-1β) that ultimately induces the process of cell death known as pyroptosis that protects hosts against a wide range of pathogens . However, aberrant activation of the inflammasome is associated with protein misfolding diseases such as transmissible spongiform encephalopathies, Alzheimer’s disease, Parkinson’s disease and also type 2 diabetes , cancer , gout, and atherosclerosis . A recent observation from Rong Hu group on association of Nrf2 with negative regulation of inflammasome revealed that, Nrf2 induces the NQO1 expression that leads to the inhibition of NLRP3 inflammasome activation, caspase-1 cleavage and IL-1β generation in macrophages. Furthermore, a well known Nrf2 activator, tert-butylhydroquinone (tBHQ) negatively regulated NLRP3 transcription by activating the ARE by Nrf2-dependent manner . In addition to the above observation, the same group has also been revealed that, dimethyl fumarate (DMF) prevents DSS-induced colitis via activating Nrf2 signaling pathway which is involved in Nrf2 nuclear translocation and inhibition of NLRP3 inflammasome assembly . A series of experiments using natural and synthetic compounds have also revealed the inhibitory effect of Nrf2 on NLRP3 inflammasome activation. For instance, treatment of epigallocatechin-3-gallate (EGCG) in lupus nephritis mice has shown to decreasing renal NLRP3 inflammasome activation which is mediated by Nrf2 signaling pathway . Likewise, citral (3,7-dimethyl-2,6-octadienal), a major active compound in a Chinese herbal medicine Litsea cubeba, inhibits the NLRP3 inflammasome activation via Nrf2 antioxidant signaling pathway in Accelerated and Severe Lupus Nephritis (ASLN) mouse model . Similarly, biochanin protected against LPS/GalN-induced liver injury by activating the Nrf2 pathway and inhibiting NLRP3 inflammasome activation in male BALB/c mice . Furthermore, mangiferin was also shown to up-regulate the expression of Nrf2 and HO-1 in a dose-dependent manner and inhibited LPS/D-GalN-induced hepatic NLRP3, ASC, caspase-1, IL-1β and TNF-α expression . Despite the negative regulation of NLRP3 by Nrf2, it also activates the NLRP3 and AIM2 inflammasome function. Haitao Wen and colleagues discovered that, Nrf2 −/− mouse macrophages have shown the defective activation of the NLRP3 and AIM2 Inflammasome but not the NLRC4 inflammasome . Interestingly, this observation is depicting the unknown functions of Nrf2 in the context of inflammation associated diseases; hence it is very important to study further to reveal the mechanism in which Nrf2 activates the inflammasome function before considering it as a therapeutic target. A very recent investigation based on chromatin immunoprecipitation (ChIP)-seq and ChIP-qPCR results in mouse macrophages revealed that Nrf2 binds to the promoter regions of pro-inflammatory cytokines such as IL-6 and IL-1β and inhibits RNA Pol II recruitment. As a result, RNA Pol II is unable to process the transcriptional activation of IL-6 and IL-1β that ultimately leads to the inhibition of gene expression. For the first time, Masayuki Yamamoto’s group revealed the novel mechanism by which Nrf2 not only transactivates its downstream genes through AREs but also suppresses the transcriptional activation of specific genes with or without an ARE through inhibiting the recruitment of RNA Pol II . NF-ĸB is a protein complex responsible for DNA transcription found in almost all types of animal cells and involved in various processes such as inflammation, apoptosis, the immune response, cell growth, and development. p65, a Rel protein of the NF-ĸB family, has a transactivation domain whereas p50 does not and requires heterodimerization with Rel protein to activate transcription. During oxidative stress, IĸB kinase (IKK) is activated and causes the phosphorylation of IĸB, resulting in the release and nuclear translocation of NF-ĸB. NF-ĸB causes the transcription of pro-inflammatory mediators such as IL-6, TNF-α, iNOS, IL-1, and intracellular adhesion COX-2. Abnormal regulation of NF-ĸB has been connected to rheumatoid arthritis, asthma, inflammatory bowel disease, and Helicobacter pylori infection-induced gastritis . It is currently considered that NF-kB activity influences the Keapl/Nrf2/ARE signaling pathway mainly in three aspects: first, Keap1 degrades IKKβ through ubiquitination, thus inhibiting the activity of NF-ĸB . Second, the inflammatory process induces inflammatory mediators like COX2 derived from the cyclopentenone prostaglandin 15d-PGJ2, a strong electrophile that reacts with Keap1 and activates Nrf2, thus initiating gene transcription with simultaneous inhibition of NF-kB activity ,  (Fig. 3 A, B). Third, NF-ĸB can combine with the competitive Nrf2 transcriptional co-activator CBP ,  (Fig. 3 C, D). Figure 3 Crosstalk between the Nrf2 and NF-ĸB pathways. (A) Keap1 directs the IKK to CUL3-mediated ubiquitination and proteasome degradation which ultimately leads to the inhibition of NF-ĸB phosphorylation and this mechanism also works as competitive binding of Nrf2 and IKK with Keap1. (B) Oxidative stress activates IKK which phosphorylates NF-ĸB, leading to its translocation into the nucleus and activation of proinflammatory cytokines such as COX-2. The terminal product of COX-2 known as 15d-PGJ2 acts as an inducer of Nrf2 that ultimately leads to the suppression of oxidative stress. (C) Nrf2 binds with its transcriptional cofactor CBP along with small Maf and other transcriptional machinery to initiate ARE-driven gene expression. (D) When NF-ĸB binds with CBP in a competitive manner, it inhibits the binding of CBP with Nrf2, which leads to the inhibition of Nrf2 transactivation. It is assumed that the Nrf2 and NF-ĸB signaling pathways interact to control the transcription or function of downstream target proteins. In justification of this assumption many examples show that direct or indirect activation and inhibition occur between members of the Nrf2 and NF-ĸB pathways (Fig. 4). In response to LPS, Nrf2 knockdown significantly increases the NF-ĸB transcriptional activity and NF-ĸB-dependent gene transcription, showing that Nrf2 impedes NF-ĸB activity , . In addition, increased expression of Nrf2-dependent downstream HO-1 inhibits NF-ĸB activity. When prostate cancer cells are briefly exposed to α-tochopheryl succinate, a derivative of vitamin E, HO-1 expression is upregulated. The end-products of HO-1 inhibit the nuclear translocation of NF-ĸB . These in vivo studies suggest that Nrf2 negatively regulates the NF-kB signaling pathway. LPS stimulates NF-ĸB DNA binding activity and the level of the p65 subunit of NF-ĸB is significantly higher in nuclear extracts from the lungs of Nrf2−/− than from WT mice, suggesting a negative role of Nrf2 in NF-ĸB activation. Moreover, Nrf2−/− mouse embryo fibroblasts treated with LPS and TNF-α show more prominent NF-ĸB activation caused by IKK activation and IĸB-α degradation . And respiratory syncytial virus clearance is significantly decreased while NF-ĸB DNA-binding activity is increased in Nrf2−/− mice compared with WT mice . Pristane-induced lupus nephritis in Nrf2−/− mice co-treated with sulforaphane have severe renal damage and pathological alterations as well as elevated iNOS expression and NF-ĸB activation compared to the WT, suggesting that Nrf2 improves lupus nephritis by inhibiting the NF-ĸB signaling pathway and clearing ROS . NF-ĸB activity also occurs when cells are treated with an Nrf2 inducer together with LPS and TNF-α. For example, a synthetic chalcone derivative inhibits TNF-α-induced NF-ĸB activation both directly and indirectly and partly through the induction of HO-1 expression in human intestinal epithelial HT-29 cells . Suppression of NF-ĸB translocation and DNA-binding activity as well as the suppression of iNOS expression in hepatocytes are found when F344 rats are treated with 3H-1,2-dithiole-3-thione (D3T) . After co-treatment with sulforaphane and LPS, the LPS-induced expression of iNOS, COX-2, and TNF-α in Raw 264.7 macrophages is downregulated, suggested that sulforaphane has anti-inflammatory activity via inhibition of NF-ĸB DNA binding . Though several experimental studies have been done to explain the link between the Nrf2 and NF-ĸB pathways, conflicting results remain. Both positive and negative regulations have been reported between Nrf2 and NF-kB . Usually, chemopreventive electrophiles 3H-1,2-dithiole-3-thione, sulforaphane and Triterpenoid CDDO-Me activate Nrf2 by inhibiting NF-kB and its downregulated genes , , . In contrast, several agents or conditions such as ROS, LPS, flow shear stress, oxidized LDL, and cigarette smoke have been shown to increase both Nrf2 and NF-kB activity . In addition, in vivo studies have revealed that NF-kB activity is decreased in livers isolated from Nrf2−/− mice and NF-κB binding activity is lower in Nrf2−/− than in Nrf2+/+ mice . However, human aortic endothelial cells treated with adenoviral vector Nrf2 inhibit NF-ĸB downstream genes without affecting the activity of NF-ĸB . Therefore, crosstalk between the Nrf2 and NF-ĸB pathways needs further investigation. Figure 4 Regulatory loop of Nrf2 and NF-ĸB. The Nrf2 pathway inhibits NF-ĸB activation by preventing the degradation of IĸB-α and increasing HO-1 expression and antioxidant defenses which neutralize ROS and detoxifying chemicals. As a result, ROS-associated NF-ĸB activation is suppressed. Likewise, NF-ĸB-mediated transcription reduces Nrf2 activation by reducing ARE gene transcription and free CREB binding protein by competing with Nrf2 for CBP. Moreover, NF-ĸB increases the recruitment of histone deacetylase (HDAC3) to the ARE region and hence Nrf2 transcriptional activation is prevented. The activation of the Nrf2 signaling pathway plays a major role in the expression of enzymes and genes involved in the detoxification of reactive oxidants by enhancing the antioxidant capacity of the cells in the human body. While many research studies are available today, the regulatory mechanisms in Nrf2 activation are not fully understood. A possible role of the Nrf2 signaling pathway in the treatment of inflammation has also been found. In vivo studies have shown that Nrf2 plays an important role in inflammatory diseases affecting different systems; these include gastritis, colitis, arthritis, pneumonia, liver damage, cardiovascular disease, neurodegenerative disease, and brain damage. In these studies, Nrf2−/− animals showed more severe symptoms of inflammation and tissue damage than WT animals. Therefore, it is believed that the Nrf2 signaling pathway has a protective effect in inflammatory diseases. Intra-tracheal installation of porcine pancreatic elastase induces chronic obstructive pulmonary disease, particularly emphysema. Nrf2-deficient mice are highly susceptible to emphysema, and decreased expression of HO-1, PrxI, and the antiprotease gene SLPI occur in alveolar macrophages. Nrf2 is considered to be a key regulator in the macrophage mediated defense system against lung injury . Nrf2-deficient mice with emphysema induced by tobacco smoke exposure for 6 months show increased bronchoalveolar inflammation, upregulated expression of oxidative stress markers in alveoli, and increased alveolar septal cell apoptosis, suggesting that Nrf2 acts against tobacco-induced emphysema through the increased expression of antioxidant genes , . With Nrf2 disruption, allergen-mediated airway inflammation and asthma using ovalbumin complex show increased airway inflammation, airway hyper-reactivity, hyperplasia of goblet cells, and high levels of Th2 in bronchoalveolar lavage and splenocytes, whereas the Nrf2-mediated signaling pathway limits airway eosinophilia, mucus hypersecretion, and airway hyper-reactivity as well as inducing many antioxidant genes that prevent the development of asthma . Carrageenan injection into the pleural cavity induces pleurisy, and 15d-PGJ2 accumulation in Nrf2 inflammatory cells is confined to mouse peritoneal macrophages. During the early phase of inflammation, 15d-PGJ2 activates Nrf2 and regulates the inflammatory process via the induction of HO-1 and PrxI. A study also suggested that COX-2 has an anti-inflammatory effect in the early phase by the production of 15d-PGJ2 . Oral administration of 1% dextran sulfate sodium for 1 week induces colitis associated with histological alterations that include shortening of crypts and infiltration of inflammatory cells in colon tissue. To protect intestinal integrity in colitis, Nrf2 could play an important role by regulating pro-inflammatory cytokines and inducing phase II detoxifying enzymes . In an Nrf2-knockout mouse model of LPS-induced pulmonary sepsis, NF-ĸB activity regulates the influence of inflammatory cytokines such as COX-2, IL-113, IL-6, and TNFα which are essential for initiating and promoting inflammation . Nrf2 reduces inflammatory damage by regulating these inflammatory factors. In these models of acute inflammation, the increased regulation of antioxidant enzymes, pro-inflammatory cytokines, and mediators by the Nrf2 signaling pathway reduces the inflammatory injury in WT animals. Interestingly, this has also been reported in Nrf2-knockout mice in which the symptoms are markedly exacerbated compared with WT mice. 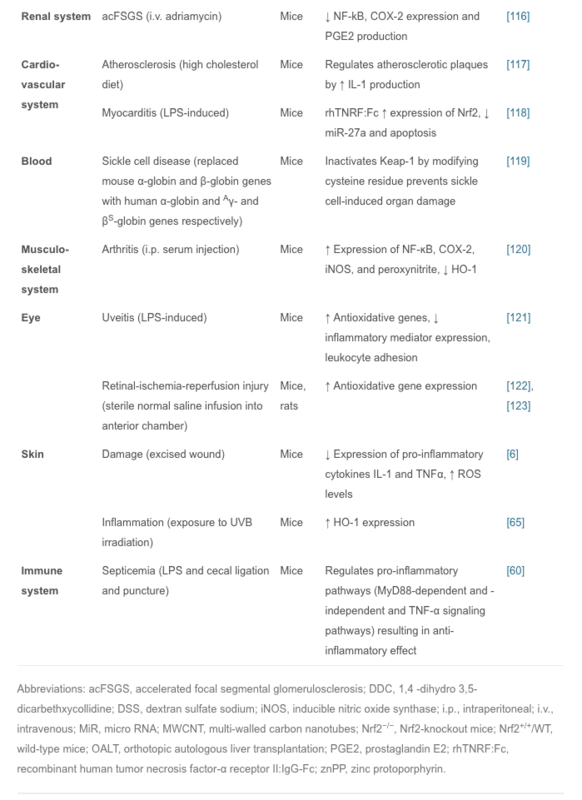 Nrf2-related inflammatory diseases are summarized (Table 1). In summary, we have discussed experiments showing that the Nrf2 signal pathway plays a regulatory role in many areas of inflammation, so Nrf2-dependent anti-inflammatory agents are important for the treatment of inflammatory diseases. Plants have been extraordinarily rich sources of compounds that activate Nrf2 transcription factor, leading to the up-regulation of cytoprotective genes. Recently, several studies were conducted to investigate the effects of different anti-inflammatory agents, mostly of plant origin. For example, curcumin is the active ingredient of turmeric and is also found in small amounts in ginger; isothiocyanates, specifically phenylisothiocyanates are from broccoli, celery, and other vegetables; and anthocyanins are from berries and grapes . Studies have shown that all these agents are not only good antioxidants but also have potent anti-inflammatory effects via Nrf2 induction , . Therefore, the development of new anti-inflammatory Nrf2 activators from plant extract has attracted much interest in medical research. In recent years, many animal experiments have been conducted to confirm the actions of these compounds. Artesunate is used mainly for severe malaria, cerebral malaria, and rheumatic autoimmune diseases; it is also effective in septic lung injury. Artesunate activates Nrf2 and HO-1 expression, and the latter reduces the inflow of pro-inflammatory cytokines and leukocytes into tissue to prevent inflammation . Isovitexin, extracted from the hulls of Oryza sativa rice, is thought to have anti-inflammatory and antioxidant properties; it plays a protective role against LPS-induced acute lung injury by activating the Nrf2/HO-1 pathway and inhibiting MAPK and NF-ĸB . Fimasartan, a newly popular angiotensin II receptor blocker acting on the renin-angiotensin system, reduces blood pressure; using fimasartan to treat mice with surgically-induced unilateral ureteral obstruction reduces oxidative stress, inflammation, and fibrosis via upregulating Nrf2 and the antioxidant pathway and inhibiting RAS and MAPKs . Sappanone is widely distributed in Southeast Asia, where it is used as an anti-influenza, anti-allergic, and neuroprotective medication; it activates Nrf2 and inhibits NF-ĸB and so may be beneficial in the treatment of Nrf2- and/or NF-ĸB-related diseases . Bixin extracted from the seeds of Bixin orellana is used for infectious and inflammatory diseases in Mexico and South America; it decreases inflammatory mediators, alveolar capillary leakage, and oxidative damage in an Nrf2-dependent manner to alleviate ventilation-induced lung injury and restore normal lung morphology . Other plant compounds, such as epigallocatechin gallate, sulforaphane, resveratrol, lycopene, and green tea extract have therapeutic effects on inflammatory diseases through the Nrf2 signaling pathway , , . Recently another phytochemical, eriodictyol, which is present in citrus fruit, has been reported to have anti-inflammatory and antioxidant effects on cisplatin-induced kidney injury and sepsis-induced acute lung injury by regulating Nrf2, inhibiting NF-ĸB, and inhibiting the expression of cytokines in macrophages , . However, numerous phytochemicals show great promise for the prevention and treatment of various human diseases, and some have already entered the clinical trials stage (Table 2). These plant compounds activate the Nrf2 signaling pathway mainly in the form of electrophilic materials that modify the cysteine residues of Keap1, leading to free nuclear Nrf2 binding with the ARE, resulting in activation of transcription of the corresponding gene. Isothiocyanates are some of the most important plant compounds you can get in your diet. In this video I make the most comprehensive case for them that has ever been made. Short attention span? Skip to your favorite topic by clicking one of the time points below. Full timeline below. 00:00:34 – Introduction of sulforaphane, a major focus of the video. 00:01:14 – Cruciferous vegetable consumption and reductions in all-cause mortality. 00:02:12 – Prostate cancer risk. 00:02:23 – Bladder cancer risk. 00:02:34 – Lung cancer in smokers risk. 00:02:48 – Breast cancer risk. 00:03:35 – Plausible mechanism driving the cancer and mortality associative data. 00:04:38 – Sulforaphane and cancer. 00:05:32 – Animal evidence showing strong effect of broccoli sprout extract on bladder tumor development in rats. 00:06:06 – Effect of direct supplementation of sulforaphane in prostate cancer patients. 00:07:09 – Bioaccumulation of isothiocyanate metabolites in actual breast tissue. 00:08:32 – Inhibition of breast cancer stem cells. 00:08:53 – History lesson: brassicas were established as having health properties even in ancient Rome. 00:09:16 – Sulforaphane’s ability to enhance carcinogen excretion (benzene, acrolein). 00:09:51 – NRF2 as a genetic switch via antioxidant response elements. 00:10:10 – How NRF2 activation enhances carcinogen excretion via glutathione-S-conjugates. 00:10:34 – Brussels sprouts increase glutathione-S-transferase and reduce DNA damage. 00:11:20 – Broccoli sprout drink increases benzene excretion by 61%. 00:13:31 – Broccoli sprout homogenate increases antioxidant enzymes in the upper airway. 00:15:45 – Cruciferous vegetable consumption and heart disease mortality. 00:16:55 – Broccoli sprout powder improves blood lipids and overall heart disease risk in type 2 diabetics. 00:19:04 – Beginning of aging section. 00:19:21 – Sulforaphane-enriched diet enhances lifespan of beetles from 15 to 30% (in certain conditions). 00:20:34 – Importance of low inflammation for longevity. 00:22:05 – Cruciferous vegetables and broccoli sprout powder seem to reduce a wide variety of inflammatory markers in humans. 00:24:14 – Mouse studies suggest sulforaphane might improve adaptive immune function in old age. 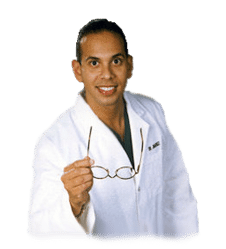 00:25:18 – Sulforaphane improved hair growth in a mouse model of balding. Picture at 00:26:10. 00:26:30 – Beginning of brain and behavior section. 00:27:18 – Effect of broccoli sprout extract on autism. 00:27:48 – Effect of glucoraphanin on schizophrenia. 00:28:17 – Start of depression discussion (plausible mechanism and studies). 00:31:21 – Mouse study using 10 different models of stress-induced depression show sulforaphane similarly effective as fluoxetine (prozac). 00:32:00 – Study shows direct ingestion of glucoraphanin in mice is similarly effective at preventing depression from social defeat stress model. 00:33:01 – Beginning of neurodegeneration section. 00:33:30 – Sulforaphane and Alzheimer’s disease. 00:33:44 – Sulforaphane and Parkinson’s disease. 00:33:51 – Sulforaphane and Hungtington’s disease. 00:34:13 – Sulforaphane increases heat shock proteins. 00:34:43 – Beginning of traumatic brain injury section. 00:35:01 – Sulforaphane injected immediately after TBI improves memory (mouse study). 00:35:55 – Sulforaphane and neuronal plasticity. 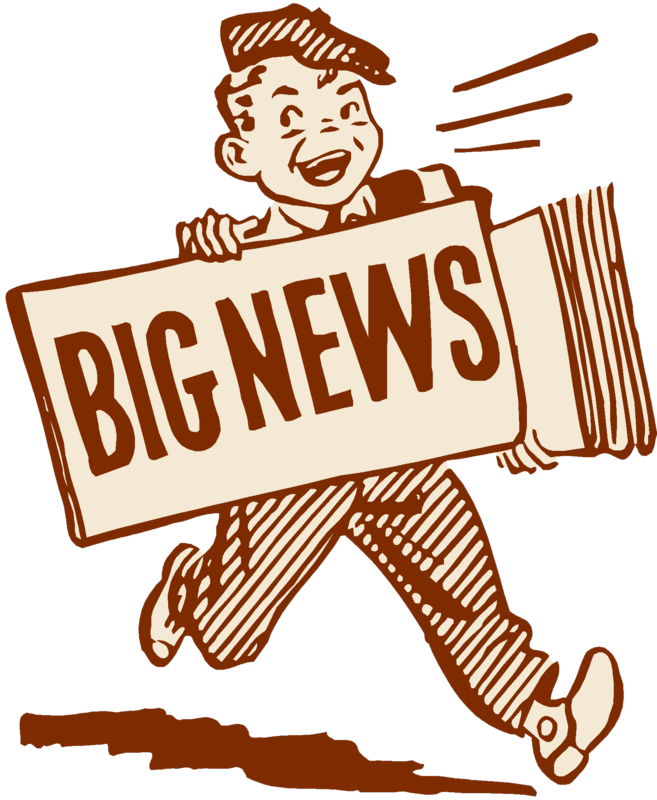 00:36:32 – Sulforaphane improves learning in model of type II diabetes in mice. 00:37:19 – Sulforaphane and duchenne muscular dystrophy. 00:37:44 – Myostatin inhibition in muscle satellite cells (in vitro). 00:38:06 – Late-video recap: mortality and cancer, DNA damage, oxidative stress and inflammation, benzene excretion, cardiovascular disease, type II diabetes, effects on the brain (depression, autism, schizophrenia, neurodegeneration), NRF2 pathway. 00:40:27 – Thoughts on figuring out a dose of broccoli sprouts or sulforaphane. 00:41:01 – Anecdotes on sprouting at home. 00:43:14 – On cooking temperatures and sulforaphane activity. 00:43:45 – Gut bacteria conversion of sulforaphane from glucoraphanin. 00:44:24 – Supplements work better when combined with active myrosinase from vegetables. 00:44:56 – Cooking techniques and cruciferous vegetables. 00:46:06 – Isothiocyanates as goitrogens. Currently, much research has focused on the role of the Nrf2/Keap1/ARE signaling pathway in inflammation. Among the enzymes upregulated by Nrf2, HO-1 is one of the representative stress response enzymes. HO-1 has prominent anti-inflammatory and antioxidant properties. In general, the Nrf2 signaling pathway also negatively regulates cytokines, chemokine releasing factors, MMPs, and other inflammatory mediators COX-2 and iNOS production, which directly or indirectly affect the relevant NF-kB and MAPK pathways and other networks that control inflammation. It is suggested that the Nrf2 and NF-ĸB signaling pathways interact to regulate the transcription or function of downstream target proteins. Suppression or inactivation of NF-ĸB-mediated transcriptional activity through Nrf2 most probably occurs in the early phase of inflammation, as NF-ĸB regulates the de novo synthesis of an array of pro-inflammatory mediators. However, there are still some limitations in the research such as whether there are connections between Nrf2 and other signaling pathways such as JAK/STAT, the significance of the current Nrf2 activators derived from natural plant sources in inflammation, and how to improve the biological activity and enhance the targeting of these compounds. These require further experimental validation. In addition, the Nrf2 signaling pathway can regulate > 600 genes , of which > 200 encode cytoprotective proteins  that are also associated with inflammation, cancer, neurodegenerative diseases, and other major diseases . Growing evidences suggesting that, Nrf2 signaling pathway is deregulated in many cancers, resulting in aberrant expression Nrf2 dependent gene battery. Moreover, inflammation plays a major role in oxidative stress related diseases especially in cancer. Application of several Nrf2 activators to counteract the inflammation may result in aberrant expression of Nrf2 downstream genes which induces oncogenesis and resistance to chemo and/or radio therapy. Therefore, highly specific activators of Nrf2 may be developed to minimize its pleiotropic effects. Several activators of Nrf2 have shown a significant improvement of the anti-inflammatory functions in oxidative stress related diseases. The best example of Nrf2 activator approved by FDA and widely used for the treatment of inflammatory disease such as Multiple sclerosis (MS) is dimethyl fumarate. Tecfidera® (registered name of dimethyl fumarate by Biogen) used effectively to treat relapsing forms of multiple sclerosis in large number of patients . However, the efficacy of using Nrf2 activators to treat inflammatory diseases requires further validation to avoid the deleterious effects of Nrf2. Therefore, development of therapies for the anti-inflammation activity mediated by Nrf2 could have significant clinical impact. Ongoing studies of the Nrf2 signaling pathway around the world are devoted to developing highly-targeted therapeutic agents to control the symptoms of inflammation, and to prevent and treat cancer as well as neurodegenerative and other major diseases. In conclusion, Nrf2 senses the levels of oxidative stress in the human body and ultimately helps promote the regulation of antioxidant and detoxifying enzymes and genes. Because chronic inflammation caused by increased levels of oxidative stress has been associated with neurodegenerative diseases, Nrf2 can play an essential role in the treatment of health issues like Alzheimer’s disease, among others. The scope of our information is limited to chiropractic and spinal health issues. To discuss the subject matter, please feel free to ask Dr. Jimenez or contact us at 915-850-0900 . Knee pain is a well-known symptom which can occur due to a variety of knee injuries and/or conditions, including sports injuries. The knee is one of the most complex joints in the human body as it is made-up of the intersection of four bones, four ligaments, various tendons, two menisci, and cartilage. According to the American Academy of Family Physicians, the most common causes of knee pain include patellar subluxation, patellar tendinitis or jumper’s knee, and Osgood-Schlatter disease. Although knee pain is most likely to occur in people over 60 years old, knee pain can also occur in children and adolescents. Knee pain can be treated at home following the RICE methods, however, severe knee injuries may require immediate medical attention, including chiropractic care. How Fallen Arches Can Cause Low Back Pain | El Paso, TX.